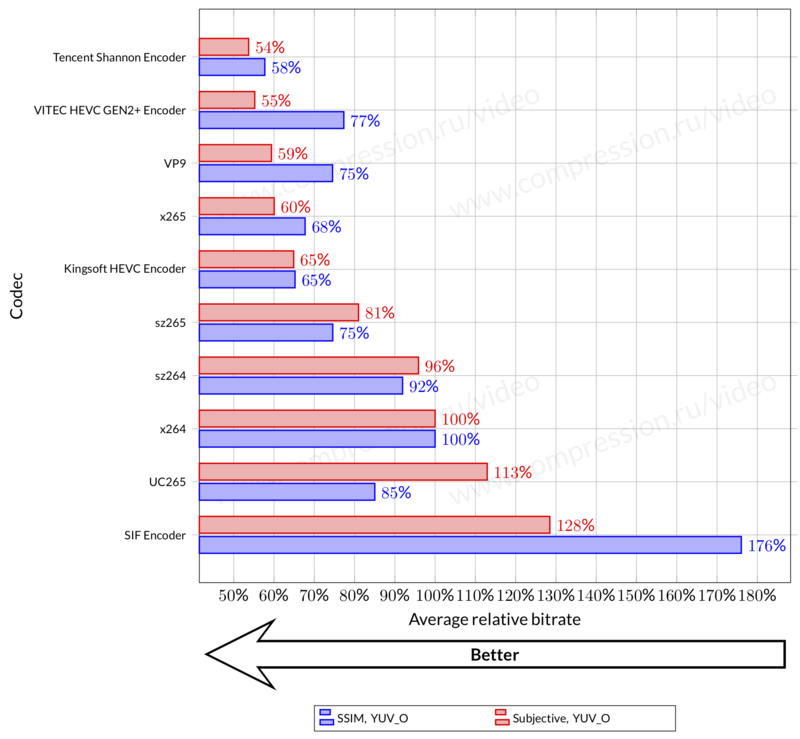 Welcome to 2018 HEVC video codecs comparison page! Below is a short summary with 3 of graphs from general report. At Bay Time-Lapse sequence, there are only three Pareto-optimal encoders: SIF, x264 and x265. Purchase Enterprise version to see all comparison results. Enterprise version is free for all buyers of Enterprise Main, Subjective and 4K reports. Below is a short summary with 3 of 535 graphs from general report. At Ducks Take Off sequence, four encoders show Pareto-optimal results: sz264, sz265, HW265 and Tencent Shannon Encoder. Purchase Enterprise version to see all comparison results. Enterprise version is free for all buyers of Enterprise Main and Subjective reports. Below is a short summary with 3 of 118 graphs from general report. 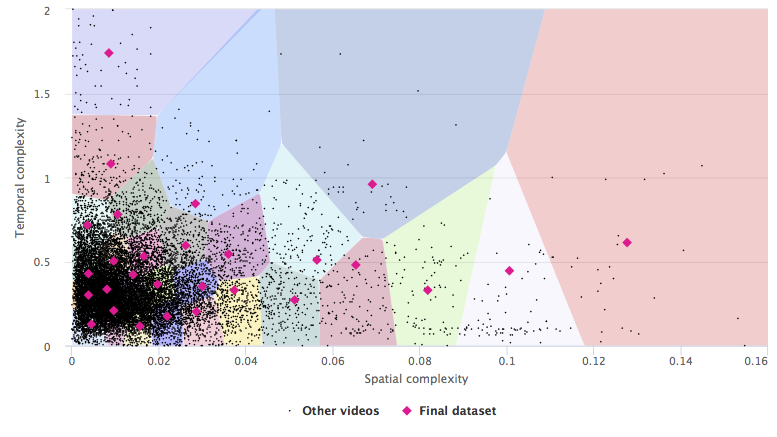 The winners determine from mean quality scores, but there is no absolute winner in the comparison, since different encoders take first place at different test video sequences: for example, on Crowd Run (short) three encoders show Pareto-optimal results: VITEC HEVC GEN2+ Encoder, x265 and VP9. Tencent Shannon Encoder shows the best quality option for Red Kayak (short) sequence. Purchase Enterprise version to see all comparison results. Enterprise version is free for all buyers of Enterprise Main Report, and Enterprise Main Report is also free for all buyers of Enterprise Subjective Report. You can also download subjective comparison rules (PDF, 3.9 MB). We tested three encoded use cases (see the description in section Test Hardware Characteristics). The universal-encoding use case has five Pareto optimal encoders in terms of mean speed and quality: UC265, Intel MSDK HEVC (SW), Intel MSDK HEVC (GA), Tencent Shannon Encoder and HW265. Nevertheless, the differences emerge for particular sequences and use cases. Free report contains the results for two of 28 sequences, and results of all sequences and use cases are available in enterprise version. Hint: click on codec's name in the legend to add or remove it. The main goal of this report is the presentation of a comparative evaluation of the quality of new HEVC codecs and codecs of other standards using objective measures of assessment. The comparison was done using settings provided by the developers of each codec. Nevertheless, we required all presets to satisfy minimum speed requirement on the particular use case. The main task of the comparison is to analyze different encoders for the task of transcoding video – e.g., compressing video for personal use. We have updated video database from which we choose sample videos for encoders' comparison. In this year, we analyzed 539765 videos hosted at Vimeo looking for 4K and FullHD videos with high bitrates (50 Mbps was selected as a lower bitrate boundary). This enabled us to find and download 942 new 4K videos and 2346 new FullHD videos. We also completed list of selected sequences with high-quality videos from media.xiph.org. This year test data set consists of 28 sequences: 5 from the old data set, 16 new ones from Vimeo and 7 from xiph.org. 25 sequences from the old data set were excluded. The average bitrate for all sequences in the final set is 449.72 Mbps, median – 192.02 Mbps. "Hera" (90 Mbps), "Television studio" (92 Mbps) and "Foggy beach" (93 Mbps) sequences have minimal bitrates. The complete list of sequences and description of selection process appears in PDF report. 14+ years working in the area of video codec analysis and tuning using objective quality metrics and subjective comparisons. 27+ reports of video codec comparisons and analysis (H.265, H.264, AV1, VP9, MPEG-4, MPEG-2, decoders' error recovery). Methods and algorithms for codec comparison and analysis development, separate codec's features and codec's options analysis. We could perform next tasks for codec developers and codec users.